In November 2016, a series of cigars from Espinosa Cigars were released. There was a total of eight to be used as part of the company’s “Backroom Series” available exclusively to the Espinosa-branded lounges. In April one of these cigars, the Wasabi, was brought onto the market again as a limited release of 500 boxes of 10. This release just happened to co-ordinate during our annual Crawfish Boil that we hosted along with Erik and his son so I managed to get my hands on quite a few of these guys. 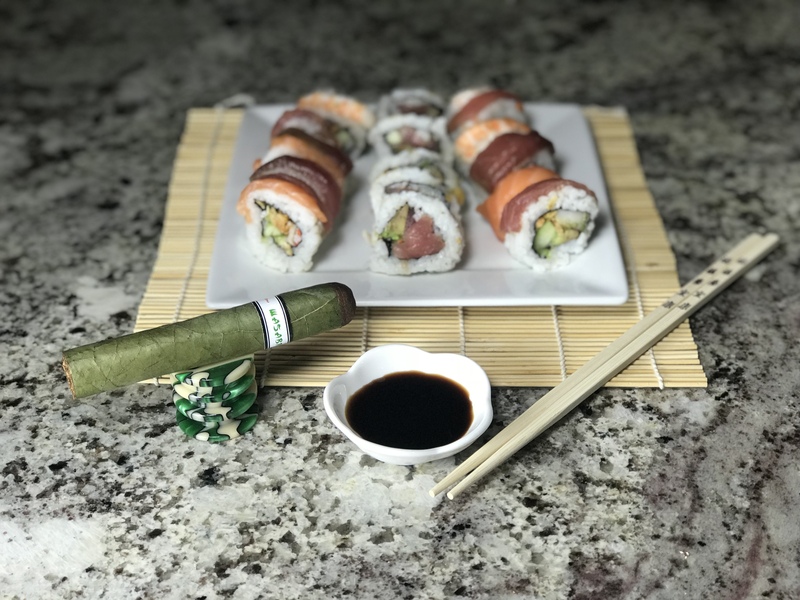 Of course as we talked about the cigar the mention of people thinking it was flavored with wasabi came up (much like how some people seemed to think that the Pickle Juice was also flavored with pickles). Of course this is not the case and the name was picked solely because he liked the name. Of course Erik does refer to it as a spicy candela so I have a sneaking suspicion that might have had something to do with it as well. When you first look at the cigar it has a pleasing overall look to it. The color of the candela is a nice pale green color. There are some noticeable veins throughout the wrapper but over all it is smooth to the touch and the seams are tight and even. The Habano tip adds a nice contrast to the overall look of the cigar. Construction feels firm but giving enough not to feel over packed when pressure is applied with the fingers and no dead spots were apparent when inspected. The odor from the body is light and sweet, while the odor from the foot leans a bit more towards a hay or barnyard odor with a hint of pepper. The cap cuts easily with no damage done to the construction. Pre-light draw is easy and has a mild tobacco flavor, some sweetness and a touch of pepper to it. The cigar lights evenly and produces plenty of medium weight smoke on the tongue. The first half of this cigar comes across with a decent amount of spice to it. In the foreground to me is a good amount of white pepper and citrus. Definitely a solid medium / medium heavy cigar at this point. The burn is even and stays consistent for the most part. The ash is a dark grey in color and drops off about every ½ inch. Reaching the second half the cigar really starts to mellow out and more of its earthy tones start to move to the front. The spice is still there on the finish but the taste of smoked cedar and peat become more prominent. This lasts until reaching the end of the cigar where the full strength becomes noticeable and the pepper fights its way back to the forefront of the flavors. In all after smoking several of these I have to say I really enjoy them. Not something I’d recommend for the beginner but would easily recommend it to someone who likes a variety of flavor and is looking for something to try that you don’t see every day. Better go out and grab some before they all disappear. 500 boxes sounds like a lot but trust me, with how good these guys are they will be gone before you know it.